Loss of eyesight and conditions such as macular degeneration are typically associated with aging. However Stargardt disease, which is an inherited form of macular degeneration, commonly affects young adults and even children. Also referred to as Stargardt macular dystrophy (SMD) or flavimaculatus, the term Stargardt disease refers in particular to a form of inherited macular degeneration that affects people at a young age. Stargardt disease is caused by the death of photoreceptor cells located in the center of the retina (back of the eye). The photoreceptor cells of the macula, the center of the retina where light comes to a sharp point, are responsible for central vision. Central vision is crucial for everyday activities such as facial recognition, driving, reading, watching television. 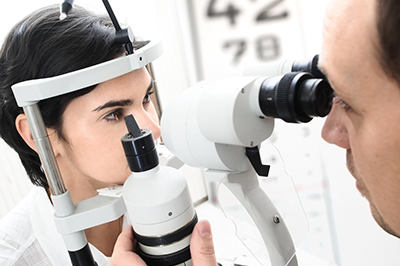 Stargardt disease does not typically affect peripheral vision or the ability to detect motion. The primary symptom of Stargardt disease is the progressive loss of central vision. Other symptoms are difficulty seeing in low light and the eventual loss of color vision in the later stages of the disease. The visual acuity of people with Stargardt disease can deteriorate to be as low as 20/40 to 20/400. Stargardt disease is a genetic disease and is passed on to a child if both parents carry the recessive gene, where each parent has a recessive Stargardt gene paired with a normal gene. Children of two carriers have a 25 percent chance of inheriting two Stargardt genes together, and therefore inheriting the disease. Research has identified the gene associated with Stargardt disease, ABCA4, and it is possible to test individuals to find out if they are carriers. Couples who are both carriers of the Stargardt disease recessive gene should seek genetic counseling before they have children to learn about the risks associated with the disease. To diagnose Stargardt disease, your eye care professional will use a slit lamp to observe whether yellow deposits of lipofuscin (a type of fat), which accumulate abnormally, and vitamin A dimers (clumps) in the retina are present. Exposure to UV light has been shown to accelerate the progress of the disease. Anyone diagnosed with Stargardt disease should always wear sunglasses with 100% UV protection.